Ben Stiller missed the point. 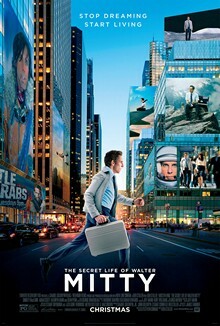 Walter Mitty is a meek and mild-mannered person who has heroic daydreams. He doesn’t actually go on those adventures; he just imagines them. Being “a Walter Mitty” means you’re a “daydreamer;” it’s both deceptive and deceitful for Stiller to keep the title and character of the beloved short story on which this is based – and change everything else. But, that’s what he mostly does here – and he’s created an awful film in the process. It lacks warmth, understanding, and any sense of delight in the power of human imagination. It’s slow, sloppy, and stupid with several sub-plots, none of which add up to anything enjoyable – and several discrepancies which Stiller hopes audiences won’t notice. As director and the star of this movie, Ben Stiller is ill-equipped to play either role. Kristin Wiig plays his love interest, helper, and connection to his employer, but mostly she plays Jennifer Aniston with all of Aniston’s facial ticks and expressions. Sean Penn has essentially “phoned this one in;” Shirley MacLaine just hangs around cooking – and looks like she has spent way too much time sampling her food. It’s not funny, not dramatic, not entertaining. It’s all such a confusing mess. Back in 1939, when James Thurber wrote the original story, he wrote it for his times. To tell that story today, it would need to be updated, of course, but in ways that kept its magic intact. There is no magic here; instead, Stiller has created a toe-tapping experience; you’ll find yourself tapping your toes and saying “OK, let’s get this thing moving…” But it never does.